Realtime Gaming will be launching its much anticipated Dragon Orb slot game next week and when it arrives Slotastic will give players 50 free spins to try it. In this brilliant new wide screen, high resolution game, a fierce mythical dragon guards his treasure. But with sticky Expanding Wilds and two progressive jackpots, he'll be parting with some of his riches! 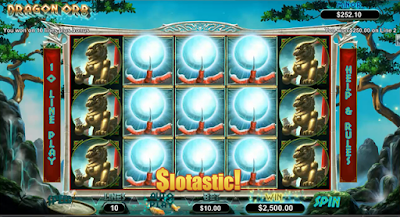 A specially designed version of the new game will also be available in Slotastic’s mobile casino. 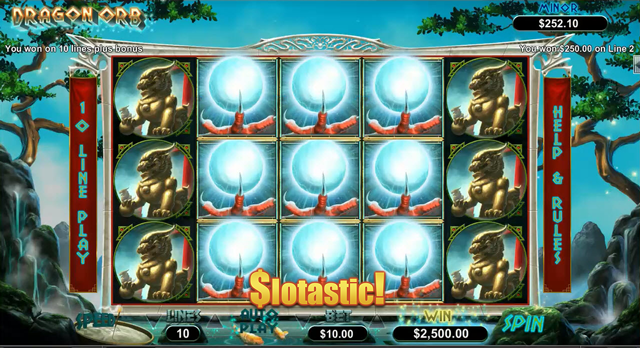 Until the end of September, Slotastic will give you 50 free spins on the new Dragon Orb slot. Claim a 100% Dragon Orb deposit bonus and you'll get another 50 free spins included. Video: New Dragon Orb Slot from Realtime Gaming at Slotastic! Expanding wild sticks during bonus re-spins. In this stunning new fantasy from Realtime Gaming, The Dragon Orb symbol is a Wild that can appear on the three middle reels. When it does, it expands to cover the entire reel and triggers a re-spin. The Expanded Wild then sticks for the re-spin. More Wilds can appear during re-spins and trigger another re-spin and another payout. Dragon Orb’s Major ($1000) or Minor ($250) progressive jackpots can be hit at random after any spin. Available to all players that have made a prior deposit in September. These bonuses are available until September 30, 2017 only. 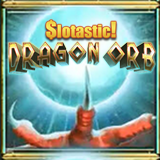 Dragon Orb is expected in Slotastic’s online casino for desktop and laptop computers as well as its newly re-designed mobile casino for smartphones and tablets beginning September 20th. Slotastic welcomes new players from anywhere in the world.